For extra depth and contrast in gaming, your best panel choice is always a Vertical Alignment or VA gaming monitor. Out of the big three which includes IPS and TN, VA gaming monitors are the least popular choice for brands, but it somehow combines the advantages of the other two to create its footprint in the display market. VA screens can provide contrast ratios of 3000:1 or more which results in stunningly rich blacks and unrivaled grayscale performance. What Should I Expect From a VA Gaming Monitor? As mentioned, VA gaming monitors offer excellent contrast ratios for rich blacks and fantastic shadow details. But one the biggest reasons why manufacturers continue to pursue development of these modules is because it offers neutral advantages between IPS and TN. For one, VA provides an improved viewing angle with lesser color tinge and distortion off center, which are widely known caveats for the faster TN panels. You can also enjoy apparent enhancements in color reproduction and vibrancy then compared to the latter, but still not on par with IPS’ capabilities. On paper, VA panel gaming monitors look like they are the best solutions for the arguments between TN and IPS users, but it does have a flaw which can affect your enjoyment. Even the spec sheets say that VA panels have a fast pixel response, in practice, this isn’t the case. VA gaming monitors suffer from ghosting and image artifacts since their white to black transitions take a lot more time than IPS or TN. We usually recommend VA gaming monitors for users who are biased towards immersive gaming more than the general chunk of the gamer populace who prefer faster screens. If you enjoy RPGs such as The Witcher 3 or Survivor Horror titles such as Resident Evil, you can reap the benefits of choosing a VA gaming monitor. VA Gaming monitors only have a small share of the whole display market and even less of the gaming space due to their limitations. Still, the issue we stated above does not seem to stop some of the tech giants in creating these excellent products. 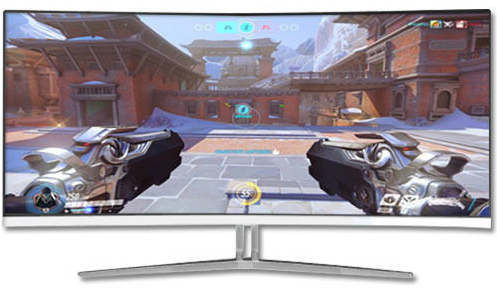 Samsung is one of the biggest proponents of VA gaming monitors, and their ultra-wide CF791 leads the company’s portfolio of competitively excellent display products. The Samsung CF791 boasts a 100Hz 3440 x 1440 curved screen with quantum dot technology for superb images in gritty titles such as Dishonoured or The Witcher 3 which rely on a picture with an inky noir. This massive gaming monitor is clad in classy white and built with an ergonomic armature which allows height and tilt adjustments. The build quality is excellent, but its real secret weapon is the inclusion of Freesync to keep your gaming experience smooth and stutter free. 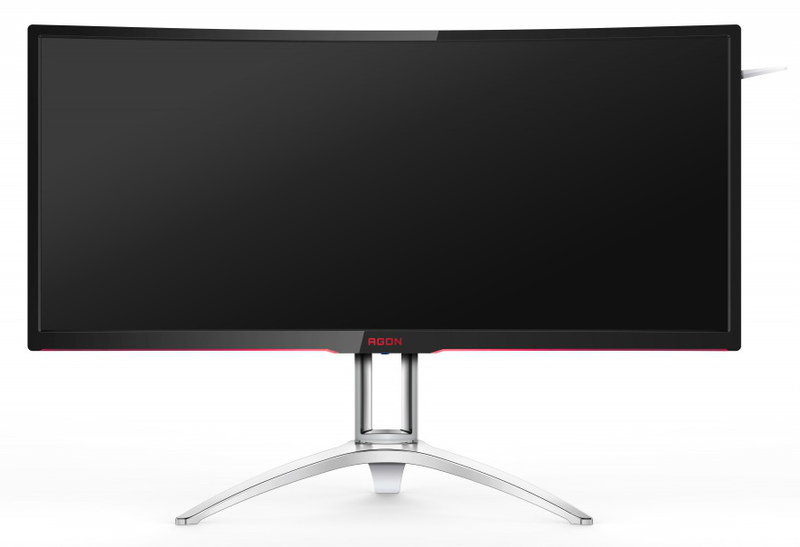 Couple that with 100Hz, and you get an AMD-based answer to the Asus PG348Q and Acer Predator X34. 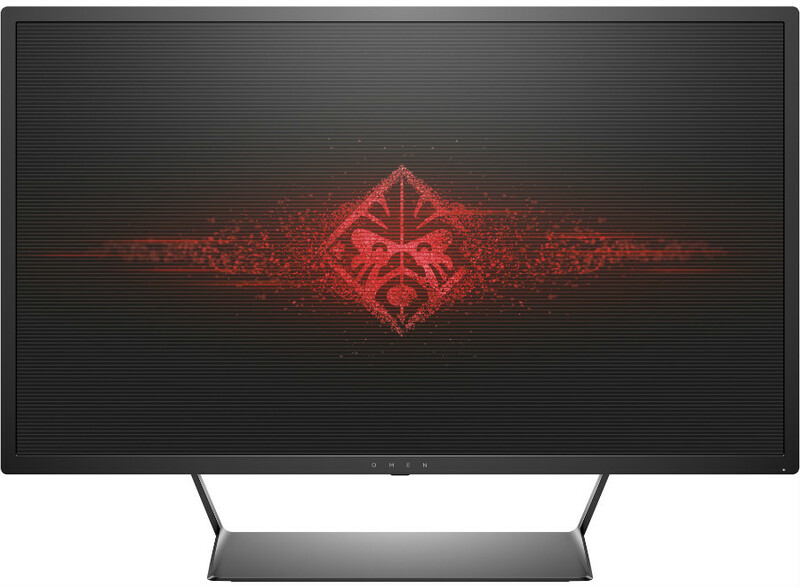 The HP Omen 32 VA gaming monitor is one of the best modern choices you can get since it provides 75Hz at 1440p Gaming, Freesync and a broad view for an affordable price. You also get to enjoy 100% sRGB gamut coverage for color critical work or eye-popping vibrancy. QHD offers a stunning upgrade in sharpness but also requires extra GPU processing power, but thankfully, you can enjoy AMD’s Freesync for stutter-free gaming. The HP Omen 32 is relatively thin from the sides which are a result of its minimalist design with a graphite finish. Another aspect where this product excels at is its excellent panel uniformity and quality which usually diminishes in big screens. All these features come together to create an immersive visual experience which can only be superseded by ultra-wide options. Want an even bigger VA gaming monitor than the option above? 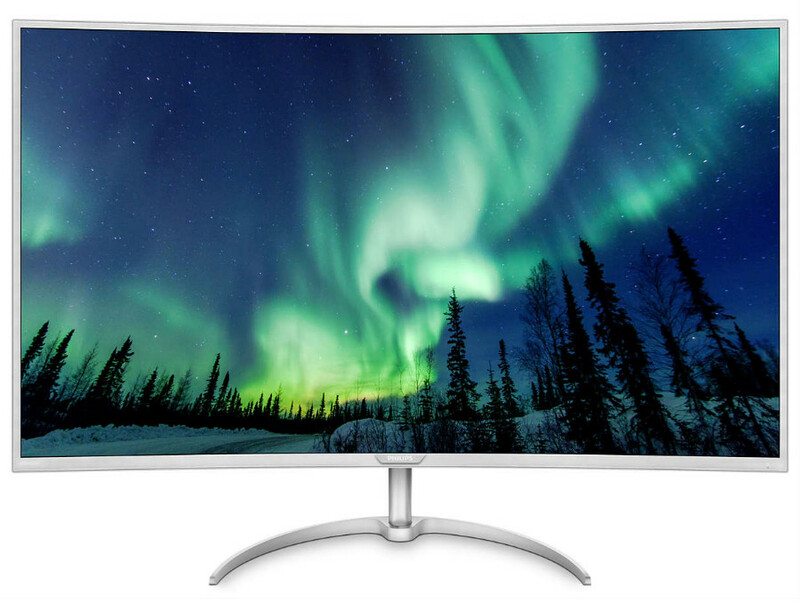 We recommend the Philips BDM4037UW curved 4K monitor for extra sharpness and a substantially larger viewing real estate. This 43-inch behemoth isn’t a gamer-centric product by any means, but it does have a decent 11ms response rate which enables users to enjoy acceptable responsiveness in gaming. The Philips BDM4037UW’s massive screen gently curves with a 3000r measurement, which according to experts does not give a huge difference, but it does introduce a slight hugging feel when viewing. Uniformity is also excellent for something so gigantic, but if you do come across some issues, you can use the Smart Uniformity feature to correct the screen. You can also appreciate 4K video better since this model can affix its refresh rate according to your media’s encoding, providing users with the ultimate digital media experience. The Samsung CFG70 brings the benefits of VA panels aboard and mixes it with a curved screen, 144Hz refresh rate, Freesync and Quantum Dot technology to provide competitive gamers with a dazzling visual experience unlike no other. Colors are also extra-rich since the CFG70 supports 125% coverage of the sRGB gamut and 75% for Adobe sRGB, making it a versatile weapon for both work and play. Aside from its bleeding-edge features, the Samsung CFG70 VA gaming monitor also includes a unique ergonomic arm which gives users extreme levels of control over their viewing angle. You also get a fantastic out of the box performance you usually can’t expect from most products, aside from the vast array of options accessed via the tactile OSD navigation joystick. Acer’s Predator line includes consistent chart toppers for their aggressive design and performance. The Z35 isn’t an exception to this pedigree since it has a hair-raising 200Hz refresh rate to captivate the hearts of gamers. This product’s 2560 x 1080 is relatively easier to run than 3440 x 1440 or 4K, but in instances where FPS vary too much, you can take control of your graphics with the help of G-Sync. These highly-sought premium features all complement the advantages presented by VA gaming monitors, but to up the ante further, Acer decided to go with a tight, 2000r curve for intense immersion and connective feel which enhances the overall gaming experience. 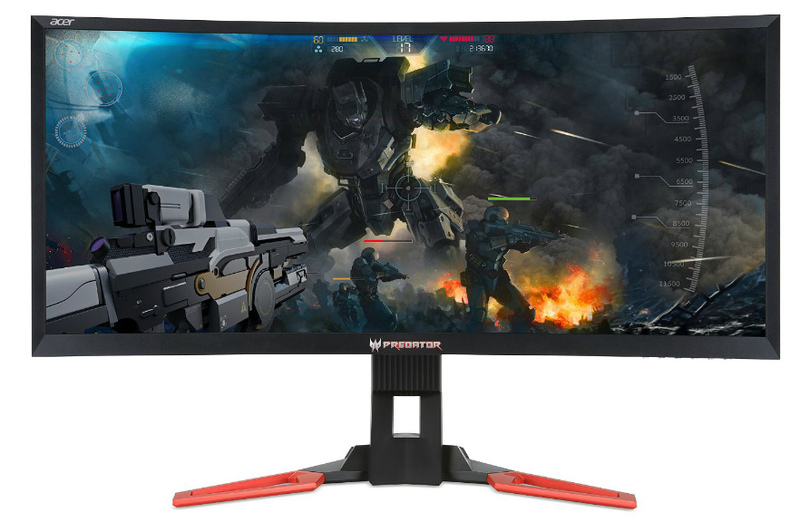 If you are a fan of the excellent Predator X34 but want more speed and an even more sinister-looking design, the Acer Predator Z35 instantly crosses our mind as the best recommendation for you. 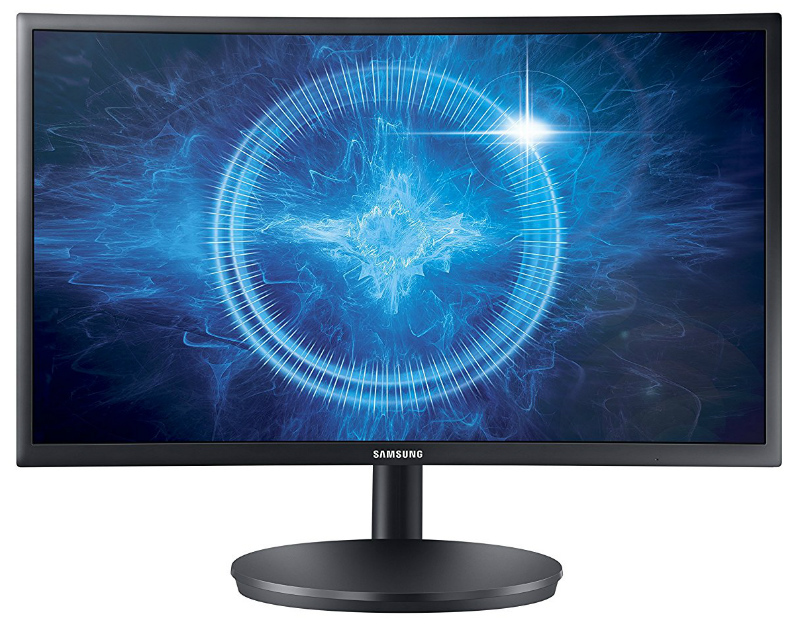 If the Samsung CF791 VA gaming monitor floats your boat but sinks your bank account, you can save a bit of cash if you go with the Microboard M340CLZ from Korea since it shares the same features for a lesser price. With this model, you also get a 100Hz VA panel with a 3440 x 1440 resolution with a little sacrifice in build quality and aesthetics. Even so, what’s important is you get the same performance you can get from CF791 including Freesync functionality and the benefits of VA technology such as deeper blacks and out of this world grayscale performance. The Microboard M340CLZ manages these results since it uses the same panel from Samsung’s OEM panel manufacturing. The AOC Agon AG352QCX is the Freesync equivalent to the Acer Z35 above since these two products share similar AU Optronics VA panels. This model also has a 200Hz refresh rate and a 2560 x 1080 ultra-wide resolution, but with an affinity for AMD’s variable refresh rate technology. This product’s 2000r curve provides a perceived wrap-around viewing experience which can captivate gamers. AOC is one of the oldest companies in the display market, so it isn’t surprising that their products also have reliable and robust build qualities. The AOC Agon AG352QCX shares these characteristics, but what we like about it is its subtle design which doesn’t forget a few hints of gamer-centric design treatment. Finally, this Freesync VA gaming monitor is a bit more affordable than its G-Sync counterpart, making it more enticing for system builders and enthusiasts. It’s quite difficult to recommend VA gaming monitors since they have a few issues such as ghosting and pixel interlacing. These flaws make them unsuitable for competitive gaming which consists of fast paced action and swiping. They are better suited for story-driven and immersive titles such as RPGs. If you prefer enhanced visuals in low-light in game environments, rich blacks, and great color transitions, VA gaming monitors such as these select few we included in this guide will provide you with the best visuals and features unique to this genre. OK, but can we have a list of good none-curved VA monitors, please? Hi, Felix! We will look into this and publish as soon as we can! Thanks! It’s so frustrating to see that Samsung has come out with a few new VA monitors but skip a design that I feel many are waiting for. Why not a 27″ 16X9 VA with 1440p and something better than 60Hz refresh rate? Hey there Chuck! 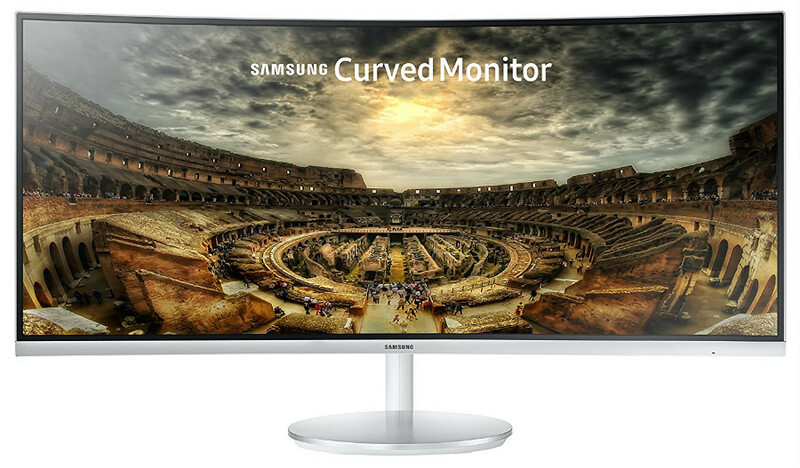 We definitely agree that a 27-inch 1440p gaming monitor would be a great contender in the market if it comes from Samsung. But unfortunately, we cannot comment on why their releases are this way. They do have up and coming products announced earlier, and until specs become available and final, we can hope or speculate for a product with the specs you mentioned. So if the pixel response is slow, does a high refresh rate like 100, 144 or 200 do any good ? Hi, Hawk! Yes, a faster refresh rate should help these flaws go unnoticed, but the naturally slow black to white pixel transitions will still induce blurring or ghosting. Although, if you aren’t that sensitive, I believe you will still get an enjoyable experience overall. Thanks for asking! Pretty good list of VA panels. I am thankful that VA panel technology is still being explored and improved, cause they really are underappreciated and can even potentially be a substitute for OLED. Sometimes I think that VA panels has better colors than the IPS. But my question is why isn’t VA panels used in handheld device like handphones or handheld consoles? Also what do you think of the AMVA panels made by Benq? Hey, Neptuniafan! We can’t comment accurately on why tech companies choose IPS or OLED for their mobile devices. We think they use IPS for its balance of snappy pixel response, clear viewing angles and vibrant colors. OLED, on the other hand, currently is only suitable for smaller screens since manufacturing processes and yields still aren’t maximized. AMVAs from BenQ/AU Optronics are top notch products that’s why you can also find them in competing offerings from other brands. Although, we think Samsung can give them a run for their money, if not lead them by a bit. Thanks!